Through hands-on experiences in the Light Lab and throughout the entire Lower School campus at Friends’ Central School, students solve problems, collaborate with peers, and find joy in learning. Cheryl Davis had never heard of an anemometer until last year. Now she not only has a firm understanding of its use as a tool for measuring wind speed, but she also knows how to make one. More importantly, so do her 7-year-old students. Davis teaches second grade at Friends’ Central School in Wynnewood. Teaching students about things such as anemometers, and learning about them herself, grew out of a hands-on, multisensory experience in a cutting-edge facility known as the Ulmer Family Light Lab. 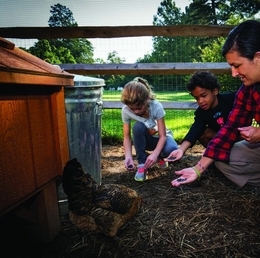 Since the Light Lab opened its doors in the Lower School two years ago, students have strengthened their connection to the world around them—and they’ve had a lot of fun doing so. The Light Lab consists of four themed Maker studios: Natural Sciences, featuring the likes of a teaching kitchen, a solarium, and year-round gardening; Fabrication, where students learn skills such as woodworking, 3-D printing, laser cutting, and sewing; Media and Computing, featuring a robotics lab, a film studio, and a green screen, among other tools; and Design, where students have the opportunity to sketch, paint murals, and build an array of models and prototypes. Although teachers and students are not “required” to use the Light Lab, nearly every Lower School classroom, from nursery school through fifth grade, is using the lab in some capacity, according to Bird. That’s because the Light Lab is integrated into all aspects of education at Friends’ Central. It’s common to have teachers from different disciplines and their students working together in the Light Lab as a way to provide greater context and a deeper understanding of a particular subject or project. With Davis, the road to building anemometers in the Light Lab began in social studies class. Last year, as part of a project about individuals who have changed the world, one of Davis’ students chose to do an in-depth study of a man named William Kamkwamba. Now considered an icon of innovation, Kamkwamba taught himself how to build a windmill to power his family’s home, irrigate crops, and otherwise breathe life into his depressed Malawian village. He later tackled more ambitious projects involving clean water, malaria prevention, and solar power, and in 2009 he authored The Boy Who Harnessed the Wind. Likewise, the Light Lab has helped students broaden their understanding through an annual schoolwide tradition known as the Fall Project. Every year, from September through January, each grade in the Lower School explores a different facet of the same theme. This year’s theme: water. In fifth grade, for example, students are focusing on society and the right to clean water. “A big part of their learning will come when these societies are tested through a crisis—maybe there’s a shortage of water or energy—and the students need to problem solve to overcome the crisis,” says Brie Daley, director of the Light Lab. As part of the crisis, students may explore sources of clean energy, and then brainstorm to generate ideas for harnessing power as a way to solve the crisis. That’s where Daley comes in. Students and faculty alike have benefited from the Light Lab, according to Daley. Directing the lab has challenged her to become increasingly resourceful, to remain flexible, and to collaborate with students and other faculty members. In other words, the Light Lab is a place where students get to make interesting things, explore new subjects in a deeply personal way, and engage in joyful play. It’s a lot of fun, Daley assures, but the lessons learned in the Light Lab build students’ confidence and challenge them to find innovative ways to peacefully transform the world. With the Light Lab now in its third year, Daley says the space is “poised in this amazing place of progress.” In fact, Friends’ Central has begun sharing its expertise with the world around it. The school has offered professional development in Makerspace education to teachers outside the Friends’ Central circle, and it has also shared its “Maker magic” with public school students by way of in-person demonstrations and a portable Maker cart.